We offer a complete solution when it comes to automated medication dispensing. With an extremely wide range of systems available, we can offer a solution for every situation. Our teams in South Korea and the Netherlands are working daily to develop the next generation of machines and associated software. Our automated dispensing systems which have various capacities for processing patient-specific medication, form the basis of our solutions. Our software offers multiple functionalities: from processing patient and medication data from an OCS file to the management of users and medication management. For every industry, we also offer optional systems for checking, controlling and winding, stock management, and various peripherals that will make serving your patients safe, efficient and simple. Any of our ATDPS machines can be placed in any environment – which machine you choose depends on your production requirements and the space you have available. We have smaller machines for the local pharmacy, such as the DEN, or our new NS 576 machine which holds 576 cartridges for a packaging centre or hospital pharmacy. The cartridge space per machine varies, but the number of canisters that can be placed into the cartridges is almost limitless. Weekly ration of medication for one patient can be produced on under one minute. The Special Tablet System (STS) can be incorporated on every machine to include special tablets in the production run. Compatibility with all standard hospital information, patient administration, inventory and invoicing systems. Authorisation is handled using an RFID for the employee running the production. All canisters are labelled with a bar code which is scanned before placement in the machine, and the STS trays have an embedded chip that is scanned. Both of these ensure that errors in placing an STS tray or a new canister are almost non-existent. All machines can be configured with an Automatic Canister Recognition System (ACRS-II). Each canister has its own ID which accurately allows the system to recognise the drug to pack, no matter where it is placed in the machine. We offer a wide choice of machines, ranging in size up to 576 cartridges and with footprints starting at 0.5 m2. This means we always have a solution appropriate for your situation with regards to space and medicine range. Our software is user-friendly and can be easily operated by a pharmacy assistant. These entry-level models automatically sort, distribute, and package based on the customised specifications while printing and can total the results fast and accurately. They are ideal for pharmacies that process 80-150 prescriptions a day. The system works with the help of a Special Tablet System (STS) of 60 cells. This means unusually shaped tablets can be easily included in the production. The DEN is modular, so it can be extended by 36, 60 or 84 cartridges. More product information can be found here. The DOOR type has a high capacity for medicines: the JV-208DO system can handle up to 208 different cartridges, the JV-244DO, 244 cartridges. Additional product information can be found here. These models automatically sort, distribute, and package based on the customised specifications while printing and can total the results fast and accurately. These are ideal for pharmacies with more than 100 prescriptions a day. The SLIDE type comes in different sizes that can handle 330 to 500 cartridges, making it the ideal ATDPS for any size pharmacy and number of patients served. More information can be found here. The newest addition to the JVM family of products, the NS Type, can handle from 300 to 576 cartridges and can be delivered with either an automatic or manual slide system. The smaller version is ideal for pharmacies that have space confinements. 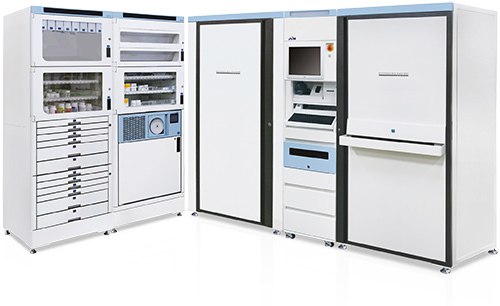 INTIPharm is an advanced automated medication dispensing cabinet system made specifically for hospitals. It can be placed on the wards or in a specific department, such as Intensive Care. It combines many of the functionalities that are already available from other suppliers, but INTIPharm has a smart cassette system called Autobox which makes it possible to unit dose syringes, vials and ampoules in a controlled way. It also has a cabinet that can be used to store and dispense expensive and high risk items such as narcotics and psychotropics. Please click here to find out more information about INTIPharm. OnCube is the newest software that combines an efficient packaging procedure with maximum patient safety. This Windows© application allows the entire production process to be managed, operated and monitored, and offers extensive functionality for processing patient and medication data from an OCS file. From a central database, it is possible to control the packaging machines as well as other optional devices, such as the VIZEN, the WIZER and the STS. More information can be found here. Applying a barcode (GS1 can be used) makes it possible to provide unique identification for every sachet. OnCube is GaMP certified. Theoretically, it is possible to continuously create new combinations of medication doses each week from the more than 100,000 registered medicines, which means that not every prescription can be filled used standardised equipment. However, time and time again, medicines are required that cannot (economically) be dispensed from standard canisters. These include seldom-used medicines or medicines with a special shape, such as half –tablets, which cannot be dispensed in an automated way using standard machines. By using our Special Tablet System (STS), you can quickly and easily integrate individual prescriptions into the production process. The software produces a graphic overview which allows special trays to be filled. The software calculates the best time for these to be incorporated in the packaging process with the medicines from the canisters. The trays can also be prepared in advance so you don’t have to take time out from caring for your customers or patients. Your ATDPS stops and signals when the tray(s) need(s) to be refilled. Special tablets are rarely used drugs, tablets with a special shape, half-tablets or quarter tablets which are entered into the special drawer. Fully automated, medicine from the tray is filled in the corresponding sachet. The STS Load Station allocates a tray to a packaging job, verifies the medicines to be filled and checks the filling of the 60 cells of the tray at individual cell level. Only authorised users are allowed to perform the tasks and all actions are logged in order to guarantee traceability. When used with the JVM packaging management software, you combine a more efficient way of packaging with maximum patient safety. This Windows application allows the entire production process to be managed, controlled and monitored. An automated inspection system is essential within the automated dispensing system. The VIZEN is a state- of-the-art inspection machine, which consigns the labour intensive manual inspection to history. The VIZEN ensures increased patient safety and improved efficiency in the production process. VIZEN inspects the contents of the sachets on the basis of images produced by the system. The medication that is present is assessed by quantity, size and shape, after which the contents are compared with the job from the pharmacy or the hospital information system (PIS/HIS). For those customers who are already using VIZEN, we can now offer a solution for increasing your production capacity. We call it Fast VIZEN and it can increase your production speed by 50%. It only requires a software upgrade and a new gearbox, so you are able to help more patients with the same amount of machines. The VIZEN DE is a compact version of VIZEN for those locations where space is limited. The WIZER intelligently separates a roll of sachets into separate sections and automatically winds and seals these per patient. The system can wind patient specific rolls starting from seven sachets and sections up to 20cm in diameter. The WIZER processes are managed from the information in the APMC database. Ideally, the WIZER is placed after your automated inspection and re-inspection processes like the VIZEN. The WIZER is ergonomically designed and easy to use. It has a small footprint and can be operated as a stand-alone machine in an area separated from your other production processes. This makes it an attractive investment to finish the process from sachet blistering to patient specific medication rolls, ready for distribution. More product information can be found here. We can also offer Sidelink, that links VIZEN / VIZEN DE and the WIZER 2.0 together so once the sachets have been inspected by VIZEN, they can be automatically rolled by WIZER. This decreases the manual workload for the employee and ensures that the sachets are rolled automatically. JVM’s i-Rolly automatically winds string sachets of medication from the ATDPS, making it easy to transport, and allows for easy and hygienic medication management. It has five adjustable levels and four tilts so it can be configured for the user’s comfort, and from the control panel, the user can easily configure the settings. The i-Rolly is delivered without bobbins which can be ordered separately. Each canister has its own ID which accurately allows the system to recognise the drug to pack, no matter where it is placed in the machine. Tracking and inventory management are ensured using the embedded chip. The rolls fit in a re-usable plastic dispenser with a tear-off edge, and are available in different colours on demand. The ezCut is a compact tablet splitter that divides tablets of all shapes automatically, saving valuable time. Because of this, there is less rejection of half-tablets by the inspection system and improves the efficiency of the production process.